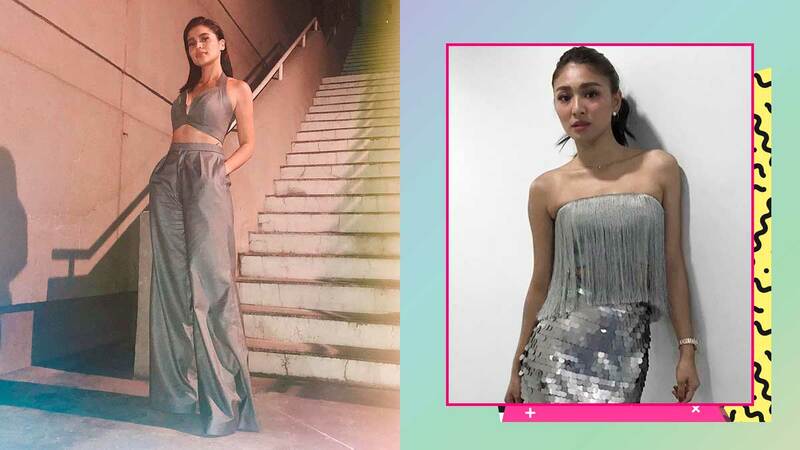 Metallic is usually big during the holidays, but we’ve noticed that there’s a growing number of celebs who are turning the space age trend into a year-round thing. For that next event you're attending, try some gunmetal and reflective fabrics, sequins, or a sliver of silvers. This muted metallic two-piece set Anne Curtis wore to the premiere of her movie Sid & Aya is a great example of how the trend doesn't have to look costume-y. Not feeling silver? No problem! The prettier rose gold as seen on Janine Gutierrez’s ensemble is something less in-your-face, but equally showstopping. Combine different textures like fringe and scales to make metallic more exciting, as seen on Nadine Lustre. Janella Salvador’s high-shine metallic take on the power suiting trend screams badass, especially when paired with booties. Maja Salvador’s sequined bomber jacket with matching trousers is a more sporty take on the trend.